Put eggs in saucepan covered in water and bring to boil. Once brought to a boil, remove from heat and let sit covered in water for 15 minutes. After 15 minutes, drain off the hot water and then run in cold water to cool the eggs. Next, peel off the shell and set aside. Meanwhile, boil pasta per box directions, then drain and rinse with cold water. 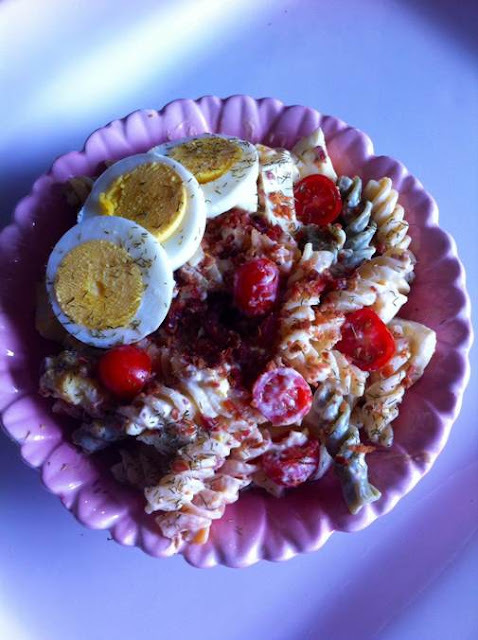 In a mixing bowl put in the cooked pasta, the sliced tomatoes, 2 chopped hard boiled eggs. I like to chop the eggs in large chunks and 1 Tbsp of bacon pieces. 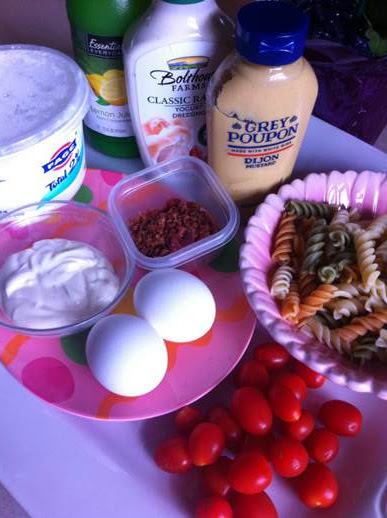 In a separate bowl, mix all the dressing ingredients. Once the dressing is fully blended then gently fold into the salad ingredients. Scoop from mixing bowl to a serving bowl and then sprinkle the other 1 Tbsp of bacon pieces over the top of salad. Garnish with the extra hard boiled egg sliced and put a little shower of dill weed to add some fresh color. That's it and enjoy! 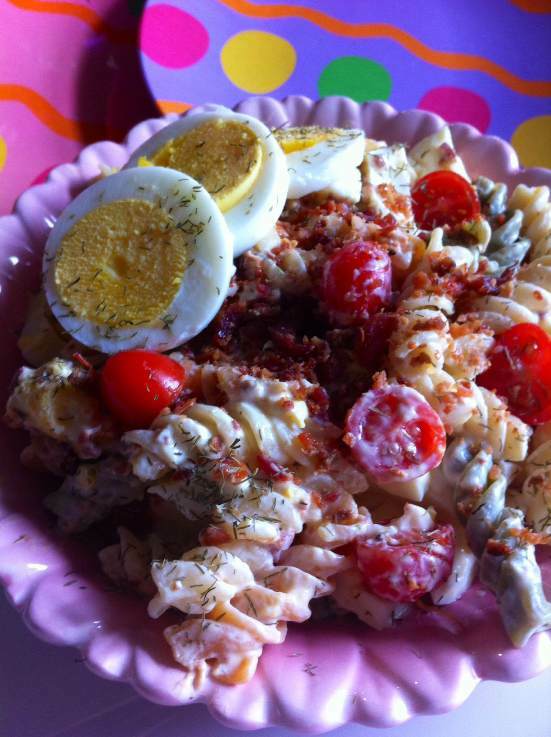 The creaminess of the dressing smothered over the eggs, pasta and bacon is so yummy! 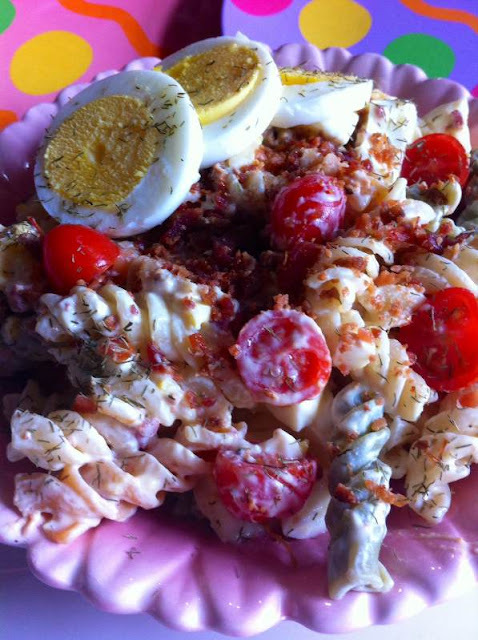 Along with the added flavor of freshness from the tomatoes make this a great spring salad. Happy Easter and Happy Spring! Looks yummy. I pinned it.